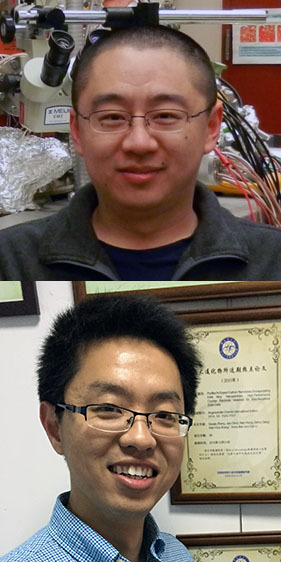 Former and current postdocs Rentao Mu (top) and Xiang Wang (bottom) are being honored with awards at the 16th International Congress on Catalysis in Bejing, China. Congratulations to two postdoctorate researchers from Pacific Northwest National Laboratory's (PNNL's) Institute for Integrated Catalysis—Drs. Rentao Mu and Xiang Wang—who are being honored with awards at the 16th International Congress on Catalysis (ICC). Rentao Mu was selected for the ICC's Young Scientist Prize, awarded by the International Association of Catalysis Societies. Nominated by his PNNL mentor, Dr. Zdenek Dohnalek, Mu earned the award for his research on water-solid interactions. The solid they looked at, ruthenium dioxide (RuO2(110)), is an important material for a number of catalysis techniques, including photocatalytic water splitting. Photocatalytic water splitting is a process that uses sunlight and a catalyst to separate water into hydrogen and oxygen. The hydrogen gas can then be used for fuel. Despite RuO2(110)'s extensive use in this and other reactions, no one had ever documented the way RuO2(110) and water interact at an atomic scale. Working as part of a team, Mu observed the way the two substances behave together, atom-by-atom. At the ICC, Mu will be presenting on their paper, "Imaging Reactions of Water on RuO2(110) Surfaces," which was featured on the cover of the 15 October 2015 issue of The Journal of Physical Chemistry C. Mu worked at PNNL from November 2012 to December 2015, and is now an associate professor at the School of Chemical Engineering and Technology, Tianjin University. Xiang Wang, a current postdoc at PNNL, earned a travel award provided by the North American Catalysis Society. The award helps cover travel, lodging, and registration costs for the ICC, and is aimed toward early-career catalysis researchers. Wang will be presenting on research he did with his PNNL mentor, Dr. Janos Szanyi, and another postdoc researcher, Dr. Hui Shi. Using a number of different techniques in combination, they looked at the intermediary steps of a particular reaction, carbon dioxide hydrogenation over a palladium-on-alumina catalyst, Pd/Al2O3. The reaction process takes in carbon dioxide (a greenhouse gas) and produces both carbon monoxide (a poisonous gas) and methane (a fuel). This is done with the help of the palladium-on-alumina catalyst. Wang and his group observed the reaction with a suite of instruments, and discovered the key part of the reaction that controlled how much of which product was formed. They found that as reaction temperature increases, more of the intermediate substances turn to methane instead of carbon monoxide. These results have important implications for using the catalyst to turn the greenhouse gas carbon dioxide into a useful fuel. The current and former PNNL postdocs will join more than 2,000 other participants at the 16th ICC in Beijing, China, from July 3 to 8. The theme for this year's conference is Catalysis for the Sustainable Development of the World, with a focus on energy production and environmental pollution. Held every four years, starting in 1956, the ICC is the world's most prestigious conference in catalysis science and technology.